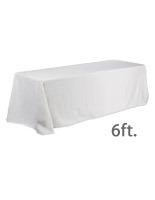 These Inexpensive Table Skirts for Weddings and Family Reunions are Shipped Fast! Order Covers and Throws for an Upcoming Trade Show! 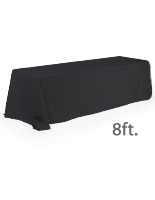 No Matter the Application, there are Table Skirts that Will Work for You! Black cloth easily complements any environment. 100% polyester fabric is durable and machine-washable. 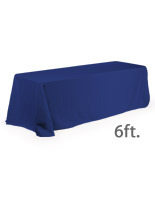 Affordable way to dress up your 6' table for professional presentation. (4) rounded edges add an impressive touch to your table! Transform your table in seconds from boring to exhilarating with these table skirts. These polyester tablecloths feature (4) rounded corners that give a professional look to booths and exhibits at trade show events. Any boxes, samples, or giveaways can be stowed underneath the table skirts. The fully draping throws can also be easily combined with a runner or other linens to accent and enhance your display, which leaves an elegant impression. These table skirts, also called throws or covers, are available in a beautiful array of rich colors, all designed to complement any color scheme. 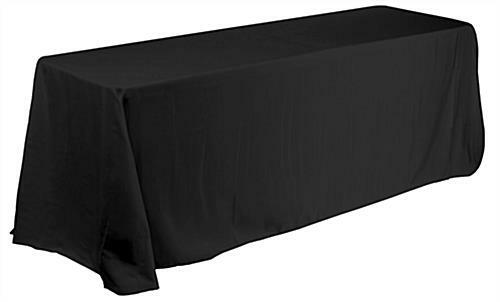 Invest in these affordable table skirts today to create an alluring presentation that lures patrons and potential customers away from the competition and over to your trade show booth. 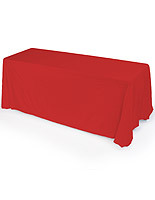 These polyester throws, table skirts are made to fit any six foot rectangular tables. 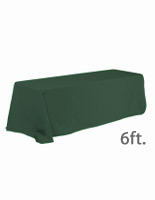 Made from polyester fabric, these covers are durable and wrinkle resistant for many years of use. 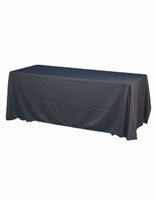 The table skirts can be washed many times before showing any signs of wear, as well. 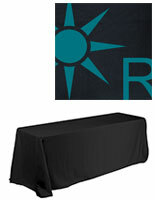 Draw attendees' attention away from the large crowd by using these table skirts. Leave a lasting impression at the next trade show event, school function, or special occasion.